This is my mom’s recipe, so it’s true comfort food to me! I’ve made different versions for every birthday in my family since I realized that my joint and digestive pain was caused by intolerance to gluten and sugar. 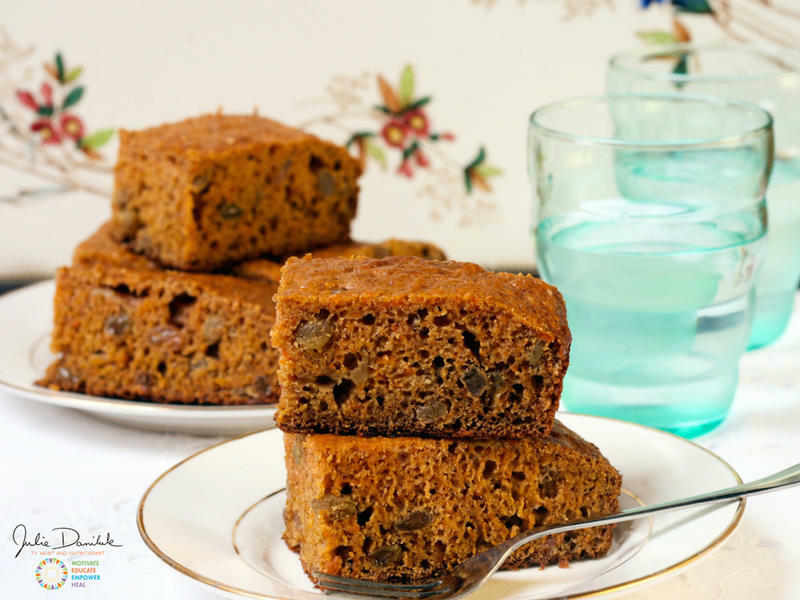 This cake not only tastes great but also delivers a medicinal dose of cinnamon. You may be shocked by the 7 tsp used in the recipe, but if you divide the cake into 14 pieces, then each piece has 1/2 tsp of cinnamon. This amount of cinnamon, if taken on a daily basis, has been shown to reduce glucose, triglyceride and cholesterol levels by 10 to 30 percent. This dessert makes me feel fantastic. I hope you enjoy it too. Try replacing some of the cranberries with pecans if you prefer crunch. 1. Preheat the oven to 350°F Line a 10 by 3 inch round glass baking dish with unbleached parchment paper. A little coconut oil on the bottom of the dish will help keep your parchment paper tacked down. Smooth the paper and fold the sides to fit the round dish. 2. In a large mixing bowl, blend together honey, coconut oil, eggs, applesauce and vanilla. 3. Process almonds in a food processor on high speed until they’re a fine meal that can be used as flour. 4. In a separate bowl, mix the almond flour, spices, baking powder and salt. Add the grated carrots, cranberries, and lemon zest. 5. Add the honey mixture to the flour mixture, stirring until well blended. 6. Pour the cake batter into the prepared pan. Bake for 45 minutes. A wooden toothpick or skewer inserted into the center should come out clean. Allow to cool for 20 minutes before slicing and serving. Recipe reprinted with permission by Julie Daniluk RHN and Random House Canada/ ©MealsThatHealInflammation2011. Check out amazing recipes and nutrition tips at juliedaniluk.com and connect directly with Julie on Facebook at Julie Daniluk and on Instagram and Twitter @juliedaniluk.